When last we met for an epic drinks smackdown back in March, fellow WLDC author Kirk and I had our preconceived notions of which paired better with food – wine or beer – challenged and in some cases totally overthrown. I left with a heightened appreciation for beer and a fascination with the subject of food pairings. 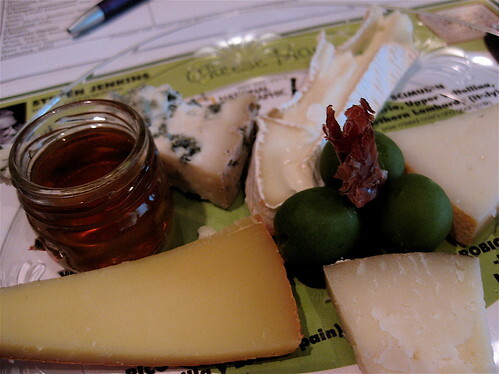 So when I was invited to attend National Geographic Live’s A Come to Cheeses Moment: Wine vs. Beer event, where beer and wine would duke it out over best pairing with cheese, it took little to convince me. Wouldn’t you know that earlier in the day I was advised to kick the dairy habit for two weeks thanks to suspected lactose intolerance (my reaction? censored!). So my second drinks smackdown fittingly became farewell to my beloved cheese. Forgive me then if this reads more as an ode to cheese than to drinks! Sigh. I inhaled deeply as I entered the Grosvenor Auditorium at the National Geographic headquarters, redolent with the stinky glorious aroma, ready to say good-bye. It was a packed house, and we were incredibly lucky in our three distinguished (and humorous) presenters – Steven Jenkins, Joshua Wesson and Nick Funnell. Both Jenkins and Wesson are regular on NPR’s The Splendid Table – Jenkins is the first American to win the prestigious title Chevalier du Taste Fromage and Wesson is the author of Red Wine With Fish and a top sommelier, having opened Best Cellars in 1996. Funnell is the brewmaster for the Great American Restaurants chain and a winner at the Great American Beer Festival. They had an amazing depth of knowledge that I can’t hope to replicate, but I’ll try to give you a taste. All of the cheese served was from raw milk, and Jenkins did point out that he had chosen obscure cheeses which might be difficult for us to get ourselves (you’ve just been challenged!). The price point of the wine was very reasonable, Wesson indicated, around $15 a bottle. Funnell had picked all local beers at roughly $7 a pint.